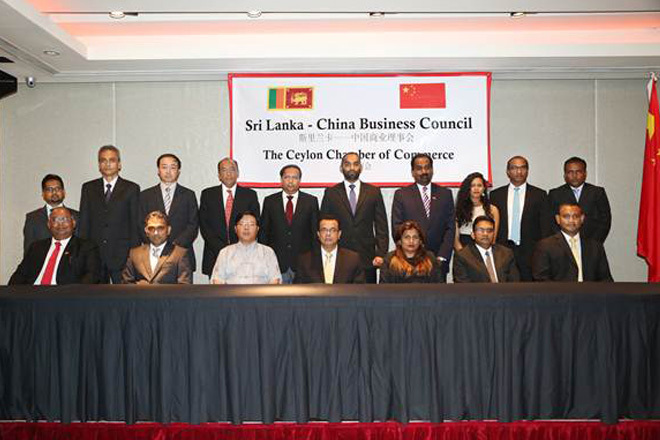 The Annual General Meeting (AGM) of the Sri Lanka – China Business Council (SLCHBC) of the Ceylon Chamber of Commerce (CCC) was held recently at Hilton Colombo Residences electing Mr. Lasantha Wickremesooriya as the President. The Chief Guest of the event was the Ambassador of the People’s Republic of China, H. E. Yi Xianliang. Addressing the members, the newly elected President Mr. Lasantha Wickremesooriya, CEO, Agro Consolidated (Pvt) Ltd thanked Mr. Navindra Abeyesekera, the outgoing President, for the immense contribution made towards the growth of SLCHBC during the last 3 years. Mr. Wickremesooriya highlighted the council’s main objectives as to promote Bilateral Trade, Investment, Technical & Economic Co-Operation, Tourism and Services between Sri Lanka and China. He further stressed the need for SLCHBC to take leadership in promoting investment and trade initiatives between Sri Lanka and China. He went on to state that Sri Lanka, in his view, was yet to exploit its full potential to benefit from the growing economy of China and therefore urged the private sector to adopt the right mind set and to understand the specific needs of the Chinese consumer. Mr.Yasantha Abeykoon- David Pieris Motor Co. (Pvt) Ltd and Mr. Thulitha Mendis – Singer (Sri Lanka) PLC elected as the Vice Presidents and Mr. Buwanekabahu Perera – National Development Bank as the Honorary Treasurer. Mr. Navindra Abeyesekera- Lanka Ceramic PLC will serve as the Immediate Past President. The event was graced by His Excellency, Yi Xianliang., Ambassador, People’s Republic of China for Sri Lanka who is also the Patron Member of the Sri Lanka – China Business Council. In his address, His Excellency stated that the “Council’s support to us as we pursue our objective of promoting trade investment between our countries is equally important.”Congratulating the newly appointed Committee, The Ambassador appreciated SLCHBC’s role in hosting and facilitating business delegations and said he looks forward to closer involvement with the Council. Mr. Navindra Abeysekera in his address as the out-going Chairman, thanked the fellow Council Members for the support and cooperation extended to him during his tenure. He highlighted the difficulty in obtaining Chinese visa at present considering the present rigid visa procedures adopted and requested His Excellency Mr. Yi Xianliang to intervene by talking to the relevant authorities with a view to finding a solution in this regard.